The consultation took place on 12-15 September 2017. It was one of five regional consultations, the others being held in Siem Reap, Cambodia; Kiev, Ukraine; Addis Ababa, Ethiopia; and Panama City, Panama. In this issue of GFO, we report on two of the consultations: this one in Abidjan and the one in Addis Ababa (see GFO article). The consultations were a central part of the Global Fund’s CCM Evolution Project, a process aimed at driving major changes to the CCM model (see GFO article). The consultation in Abidjan was organized by the 5% Initiative, a program of the Government of France to provide Global Fund–related technical assistance (TA). Two CCM representatives (one from government and one from civil society) from each of 21 countries participated. The countries were: Benin, Burkina-Faso, Burundi, Cameroon, C.A.R., Chad, Comoros, Côte d’Ivoire, Djibouti, DR Congo, Gabon, Guinea-Conakry, Madagascar, Mali, Morocco, Mauritania, Niger, Republic of Congo, Senegal, Togo and Tunisia. Also participating were representatives from multiple partners, as well as watchdog and civil society organizations; and, from the Global Fund Secretariat, representatives from the CCM Hub, the Grant Management Department and the Ethics Office. Aidspan was represented by its Executive Director, Ida Hakizinka. The four-day program was divided into two parts. The plan was that the first two days, which were facilitated by the Global Fund Secretariat, would consist of a consultation on the evolution of the CCM model; while the last two days, which were led by the 5% Initiative, would focus on good practices and technical assistance to CCMs within the framework of an evolving CCM model. As it turned out, there was quite a bit of overlap between the two parts. The objectives of this portion of the consultation were, first, to have CCM members share their views on how to strengthen and modify CCMs to be better aligned with the Global Fund’s new Strategy for 2017-2022; second, to address issues raised in the 2016 audit of CCMs conducted by the Office of Inspector General (OIG); and, third, to discuss how CCMs could be more adaptable to country contexts. On Day 1, representatives of the Global Fund Secretariat presented the CCM Evolution project roadmap. The roadmap consists of three main phases. Phase 1, which took place in the period ending in May 2017, involved an assessment of the current state of CCMs. Phase 2, which runs from June to December 2017, involves developing a vision for CCMs as well as “evolution pathways.” The five regional CCM consultation workshops are part of Phase 2. So are consultations with other stakeholders, internal and external, including the Global Fund Board and committees. Phase 3 of the roadmap, which is scheduled for January to March 2018, will consist of the preparation of a strategy on how CCMs should evolve as well as a detailed implementation plan. The strategy and plan will be submitted to the Board for approval at its meeting scheduled for 9-10 May 2018. Phase 3 will include developing a strategy rollout roadmap as well as making changes to CCM guidance documents and updating training materials. Following the presentation of the roadmap, participants were assigned to breakout groups to discuss the following topics: CCM functioning and CCM secretariat; composition and engagement; national programs coordination and linkages; oversight; and ethics and the proposed CCM Code of Conduct. In the reports back to the plenary, participants put forward ideas to address the day-to-day challenges of CCMs, and to improve CCM functioning. There were suggestions for improving the performance of CCM secretariats; enhancing the quality of member engagement in CCMs; and professionalizing the oversight function. In the workshops, participants tackled issues such inadequate budgets to conduct CCM activities; the limited expectations for members volunteering their time; the need for strong leadership on the CCM; and the lack of support provided by the Global Fund Secretariat. communication should be improved through the use of local language(s), a CCM newsletter, or a website. There was discussion concerning whether or not external experts should be paid to support the CCM’s oversight committee. Alternatively, participants said, the oversight function itself could be externalized, or oversight could be done through a partnership involving the CCM and other partners. In the end, though, there was no consensus on this issue. Some participants said that on some CCMs it does not make sense to have a representative of the private sector. They suggested, therefore, that representation from the private sector not be mandatory. There was also a suggestion that some members of the CCM be paid for their work on the CCM, but there was no consensus on which ones. There was also no consensus on a suggestion that CCM members be copied on all communications between the PR and the Secretariat. In addition, there was discussion concerning the CCM secretariat. Among the suggestions put forward was that a competitive salary be offered for the position of secretary of the CCM; and that the level of the secretariat be raised. The representatives from Global Fund Secretariat said they would prepare a complete list of the suggestions. Day 2 saw a more focused discussion on the evolution of the CCM model in the context of a differentiated approach to the role and structure of CCMs. As defined by the Global Fund, the differentiated approach consists of evolving from the status quo where there is one standard model for all countries to having several models based on country size and operational context. Under the proposed approach, country size includes three categories: high impact, small and standard. The operational context consists of two categories: challenging operating environments (COEs) and countries in transition. The figure below explains the different categories in the proposed differentiated approach. This topic generated passionate debate among the participants. Most of the CCM representatives did not appear to be at ease with the concept of differentiation. They believed that each CCM was unique, and so they were more comfortable with the current model. As a result, few innovative ideas were forthcoming concerning how to change the model. Further, although the proposed differentiated approach was presented as being linked to the Global Fund’s Strategy 2017-2022, most participants did not consider CCM evolution as being related to the new Strategy. Participants nevertheless viewed the discussions at this consultation as a unique opportunity to discuss the challenges of managing CCMs in their countries, and to have the Global Fund Secretariat hear this discussion first-hand. 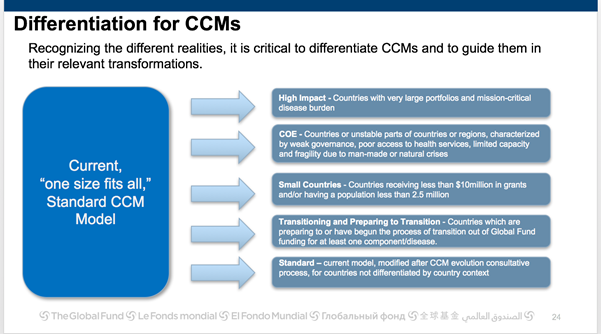 The original objective for the second part of the consultation, led by the 5% Initiative, was to reflect on how TA could play a role in the evolution of CCMs towards the differentiated structures that the Global Fund had proposed. However, as a result of the feedback from participants in the first part of the workshop, the focus was less on CCM differentiation and more on CCM evolution. Representatives of the 5% Initiative presented an overview of the TA provided by the initiative. Forty percent of the TA has targeted CCMs. Most of that TA was to support the country dialogue process. With respect to TA provided for strengthening CCMs, the vast majority of it was related to basic governance and CCM oversight under the new funding model; and to the evaluation and performance assessment process, including preparation of a performance improvement plan. At one session, experts involved in a TA mission to CCMs in DR Congo and Morocco presented their impressions of the TA, as did some of the beneficiaries of the TA. In addition, a panel provided examples of CCM oversight in Togo; CCM governance in Côte d’Ivoire; civil society monitoring of Global Fund programs in Cameroon; and key affected population involvement in the Mauritius CCM. Nevertheless, through the lens of TA, the question of CCM evolution was eventually broached in the break-out sessions. Many participants agreed that CCMs should be able to reach a degree of "strategic engagement” at country level and beyond. At country level, this could mean choosing a health systems approach rather than a vertical one, and allowing CCMs to reach beyond their Global Fund mandate to participate in health systems governance. Participants also talked about the concept of global CCM governance. They said that CCMs should create a regional community of practice, for example in West and Central Africa, and in Eastern and Southern Africa, involving regular meetings – like the Abidjan workshop ­– to exchange good practices and raise issues for the Global Fund Secretariat and Board to hear. Participants said that the African constituency bureau could play a part in organizing these meetings. Another key message from the second part of the workshop was that CCMs should have an institutional memory, building on the expertise of their members, in order to become more sustainable and less prone to have to “start over again” after membership renewal. At the end of the four-day workshop, participants expressed a lively interest for this kind of meeting and an appetite for more, similar exchanges. Based on the outcome of the regional workshops and other consultations, the Global Fund Secretariat will prepare a proposed strategy on how CCMs should evolve, for presentation to the Strategy Committee and the Ethics and Governance Committee. As indicated above, the strategy and a detailed implementation plan will be presented to the Board in May 2018. The 5% Initiative said that it may consider expanding the support it provides based on the outcomes of this consultation – but also on other factors, such the end of the Grant Management Solutions (GMS) project (see GFO article); an evaluation of the initiative that was recently conducted; and the fact that 5% will soon become 7% (meaning that France will earmark 7% of its contribution to the Global Fund for the provision of TA through what is currently called the “5% Initiative”). See also the last part of the GFO article on the consultation in Addis Ababa for an update on the status of the CCM Evolution Project, provided to Aidspan by the CCM Hub.